Gives diesel engines with CRDi systems great performance and fuel efficiency. Better emission compared to regular diesel power plants. Adress and controls extrem high temperatures created by CRDi engines. Motul Specific CDRi Diesel 5W40 gives diesel engines with CDRi systems great performance and fuel efficiency as well as better emission as compared to regular diesel power plants. 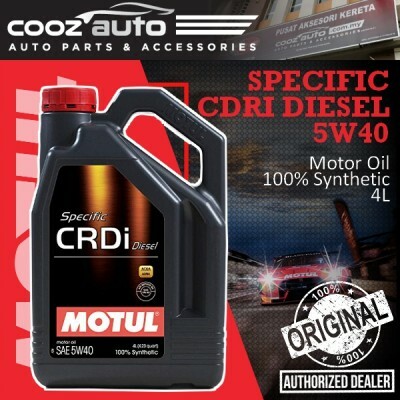 To realize the benefits and performance of CRDi, Motul formulated the first Specific CRDi Diesel oil in the market. Since oil is a vital component in maintaining and maximizing the performance of an engine, selecting the right oil for a specific application is necessary. Motul Specific CRDi Diesel oil is designed to address and control extreme high temperature that CRDi engine creates.